ETEL is proud to now offer short stroke actuators in North America through HEIDENHAIN Corporation. 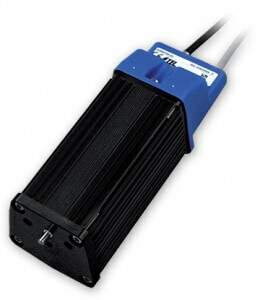 These extremely reliable Z Standalone Actuators can be used in any application where force, throughput and long lifetime are required within a small form factor. These ETEL actuators have been designed to cope with the stringent requirements of Turret Testing Handlers, providing an average of ten independent Z axes for a single machine. Nevertheless, ETEL’s short stroke actuators are suitable for all applications requiring pure axial movement over a short stroke, especially when high dynamics and a small footprint are key requirements. Such applications include touch pad calibration, chip shooters, die ejectors, and many more! ETEL’s Z Standalone Actuators are designed with costs in mind. Teflon-coated plain bearings offer a long lifetime with low friction, while keeping costs low. A low overall number of parts, plastic injected covers, and automated production all contribute to cost effectiveness. ETEL’s short stroke actuators are also designed for high performance. Despite the small form factor, these actuators are capable of providing a peak force of up to 120 N and a continuous force of up to 30 N. With acceleration up to 30 g and speeds up to 1 m/s, the Z Standalone Actuator can handle almost any application requiring high dynamics. Detailed information about ETEL short stroke actuators is available here. ETEL takes pride in their policy of full disclosure about their motor performances. It is standard for all data sheets to list specifications at the motor’s maximum allowable temperature to ensure the user is able to utilize every bit of power that the motor lists.